2 weeks ago I was blessed with the arrival of my first child. Since returning home with my baby I’ve noticed how helpful my smart home has been whilst looking after her. A lot of people consider smart homes to be suited towards lazy people, however in this blog we can show you how useful they are. It can be especially helpful when you’re trying to carry a new born around your home. Walking around the house with a baby in your arms make simple tasks like switching on the light increasingly difficult. Having a voice control unit such as the Amazon Echo can help make it easier to perform basic tasks. Light switches can be at awkward angles and sometimes you’re carrying a baby, nappies, wipes, clothes etc. Making it a challenging and unsafe to switch on the light. This potentially could cause an injury to your new born. Being able to control lights or other electrical items via voice can help when trying to balance the baby and sort out appliances. Music can also be soothing for the baby, reduce the need to reach for a device and sort through tunes by using a voice control device. Using Amazon Echo linked to a music streaming service such as Amazon music. You can play songs on demand and find out which tracks sooth your baby. Having to put your baby down and search tracks is time consuming and could unsettle the baby further. 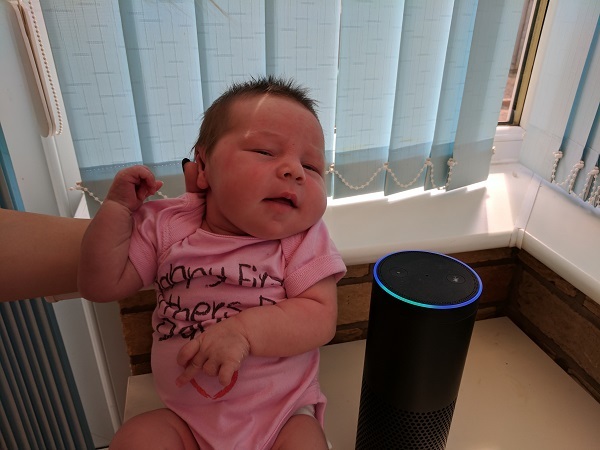 My baby in particular loves Ed Sheeran so by saying “Alexa, play Ed Sheeran’s latest album” is very useful for keeping the peace. When the baby is crying it masks your voice making it difficult register a command. It can make the situation more stressful when a baby is screaming at full volume and alexa won’t switch on the lights. However, most lights can still be operated by switch, putting you back to square one. Common areas of the house that you walk through such as the hall and landing are situations where you only need light for a short period of time. These are ideal situations where motion sensors can be used to trigger lights. Similar to voice control mentioned above, when your hands are full adding another task such as a light switch to the equation makes things complex. The motion capability helps to turn lights off when you are done, helping to save electricity and not have to worry about coming back to turn it off. Adding motion sensors in the required areas may require committing to a smart home hub and outlaying on several sensors and lights. This all adds to the cost of creating a smart home. It also means you need to commit to learning about smart home solutions and the advantages and compatibility of each one. Generations of people have survived without the need for a smart home. Having a smart home however is another measure parents can take to make life a little easier and a little safer for their new born. With the added benefit of lights on smart sensors, there is no need to go back to lights to switch them off. This helps you focus your attention on your baby and save you money in the long run. Let us know the ways in which your smart home can help with a new born baby, either on twitter or in the comments below. Smart blinds, are they the next big smart home addition?